Search for all "FMLP-related receptor II"
Rabbit anti Human, Monkey FMLP-related receptor II. Product is tested for Immunocytochemistry/Immunofluorescence, Paraffin Sections. Synthetic 18 amino acid peptide from N-terminal extracellular domain of human FPR3 / FPRH2. Percent identity with other species by BLAST analysis: Human, Chimpanzee, Gorilla, Monkey (100%); Orangutan (94%); Gibbon (89%). Immunohistochemistry on Paraffin Sections: 3 µg/ml. 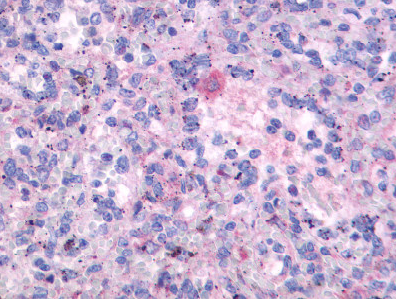 FPRL2 is a Chemoattractant Receptor involved in the transduction of signals in myeloid cells. 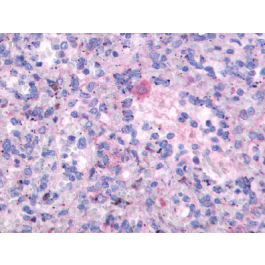 Although it is structurally homologous to FPRL1, human FPRL2 does not recognize the N-formylmethionyl peptides (FMLP) as ligands and is not expressed in neutrophils. Ligand: Annexin 1 (lipocortin 1), humanin, F2L (an acetylated amino-terminal peptide derived from the cleavage of the human heme-binding protein, an intracellular tetrapyrolle-binding protei), uPAR84-95 peptide. Store the antibody undiluted at 2-8°C for one month or (in aliquots) at -20°C to -70°C for longer. Detects N-terminal extracellular domain of Formyl Peptide Receptor-Like 2 (Family: GPCR; Subfamily: Chemoattractant).